Chestnut kernels are a nutrient-dense healthy snack, favored by all ages. 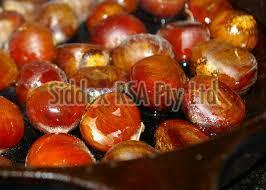 We selected high quality whole chestnuts, natural matured & organic, roasted and unshelled. Roasted chestnuts commonly spark thoughts of the holiday season and sitting by an open fire. These tree nuts are more than just the topic of song lyrics. Chestnuts are lower in fat than similar nuts such as pecans and walnuts -- good news if you have been advised by your doctor to watch your intake. Chestnuts have a pleasing taste and are packed with nutrients.